Unconditionally stable: south hemisphere. Infinity becomes compact. Circles which are never closed on the Smith chart get together in the South hemisphere. Any s1p and s2p files can be imported (touchstone format). 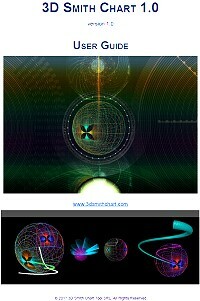 Parameters are plot on both 2D& 3D Smith charts in Z/Y reconfigurable format. The tool proposes a dynamic frequency sweep to tune live the device under study. The ports have complex characteristic impedances too. The tool can deal with voltage reflection coefficient / power wave. Dr. Andrei Muller, progenitor of the world's first 3D Smith Chart software program, has teamed with a handful of able colleagues to release a commercial version of this paradigm-changing design and analysis tool. 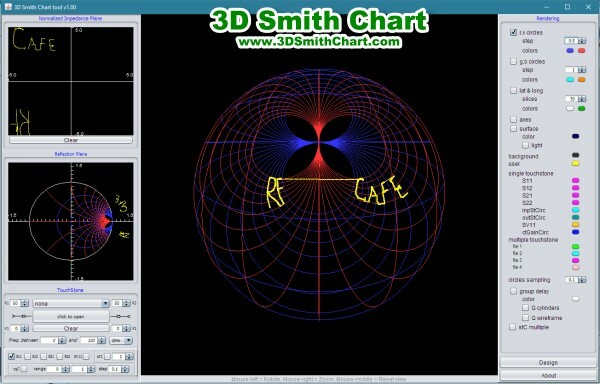 3D Smith Chart enables you to visualize S-parameter data in ways not possible from the Flatland dweller's perspective that is the traditional 2D Smith chart. Flatland existed in a plane, and from an observer's perspective a 3-dimensional object entering the plane from along the Z-axis seemed to appear out of nowhere; only its distance and width changed as it passed through. Flatland dwellers rejected the existence or even the possibility of a third dimension, dismissing offhand a rational requirement for one, even punishing the citizen who dared to propose such a concept. After all, two dimensions had served the world just fine. A similar restraint on perspective is imposed upon the classic 2D Smith chart. 3D Smith Chart does for the Smith chart what Einstein's concept of Relativity did for physics by adding the fourth dimension of time. Just as with most new concepts, the true value of the relatively new 3D Smith Chart (debuted in 2013) has not been grasped yet by the engineering world. Heck, getting your head around even the classic Smith chart is daunting enough for the neophyte RF guy (or gal), so a bit of apprehension is understandable. As with the classic Smith chart, however, once you finally comprehend and feel comfortable with using it, the 3D Smith Chart opens new realms of understanding the parameters your are working with. My prediction is that either NI AWR or Keysight Technologies will one day be integrating the 3D Smith Chart into its design environment. Whichever does it first and trains the engineering community on its use and indispensability as a design tool will see its fortunes rise quickly. Secretly, product development managers are probably asking their staff why they didn't think of the 3D Smith Chart before Dr. Muller did. The features and possibilities for application are way too expansive to cover here. Your best option is to review the detailed User Guide, and direct any questions to Dr. Andrei Muller. Pricing is very reasonable and discounts are available for students, universities, and corporate multi-user licenses.